All payments to be paid via bank transfer. A £75 deposit (per week) is required to secure your booking. The deposit will be returned promptly after your holiday, assuming the caravan is left undamaged. Cost of any damage or extra cleaning will be deducted from your deposit. Full payment is due 6 weeks prior to your holiday - if at 4 weeks before your holiday starts the full payment has not been received and our efforts to make contact with you are ignored, we will cancel your booking forfeiting all monies paid. If you are to be found to be causing a disturbance and are evicted by Looe Bay, all monies are forfeited. When booking with us we will ask you details of the size of your party staying, if this is to be found different then what was originally stated in your booking and we have not been notified before your stay, you may be asked to vacate without your refundable deposit. Our caravan is situated in the quiet, owners section of the park but still not too far away from the facilities on site. It is a bright, clean caravan with views of the local countryside with a large area of decking which makes a pleasant place to sit outside. It also has a lockable gate, so is ideal for guests with dogs or small children. Unlike many of the caravans on this site, ours has parking spaces right next to the caravan and a short paved pathway direct to the gate. The lounge area is very spacious with ample seating, which includes: a pull-out double bed, dining table, gas fire, a flat screen TV and DVD player. We also have a Sky dish fitted so, if you want to bring your Sky box from home and have the best of both worlds, you are more then welcome! The main bedroom has a double bed, a good sized wardrobe/dressing table and a wall mounted TV with DVD player. The second bedroom has two single beds and a wardrobe. The bathroom has a wash basin, toilet, electric heater and a very large and amazingly powerful shower! Duvets and pillows are provided, please bring your own bedding and towels. In the kitchen area, there is a full size gas cooker, a full size fridge with seperate freezer, a microwave, kettle, toaster, etc. Plenty of pots and pans, plates, cutlery, cups etc. Gas and electricity are included in the price and there are two portable electric heaters if needed. 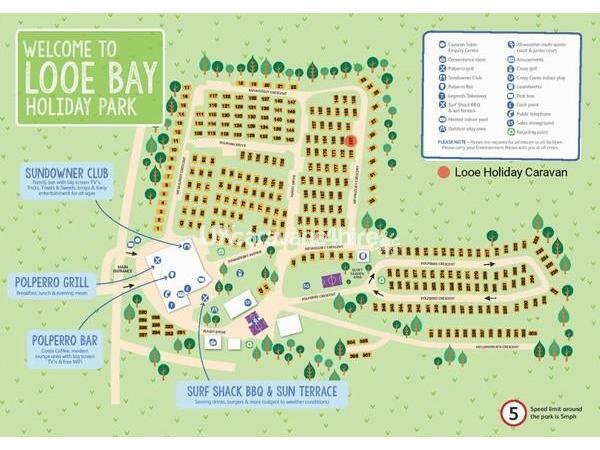 The award winning 4* Looe Bay Holiday Park is run by Parkdean and has many facilities including a very warm indoor swimming pool, children's indoor and outdoor play areas, children's daytime and evening entertainment and evening bingo. There is also a shop, an excellent restaurant, a bar, takeaway and entertainment venue. Entertainment passes can be purchased from the park reception, the price for only £5 per person per week, no charge for under 3s. 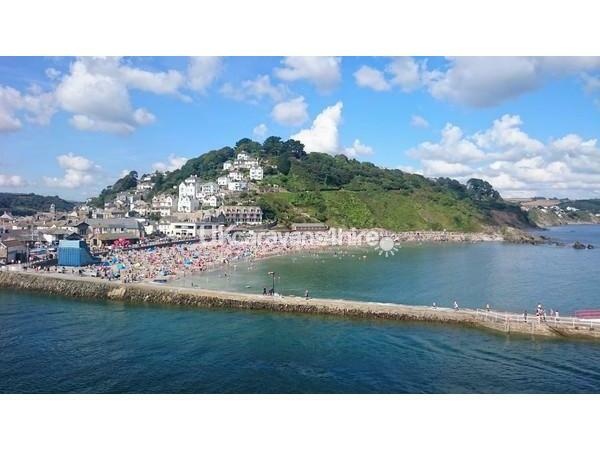 Looe Bay Holiday Park is situated about 1 mile from the picturesque fishing town of Looe. Buses to Looe, Polperro and Plymouth stop right outside the park. The famous South West Coast Path is less that a mile away. Plymouth (Britians ocean city, with excellent shopping facilities) is 20 miles , Dartmoor about 25 miles and the Eden project is about 15 miles from the park. Looe golf club is just up the road and there is a nice beach at Millendreath, about 1 mile away. Which can be walked to on a footpath from the caravan site, currently parking at Millendreath is free. We require a £75 deposit per week to secure your booking, Your £75 deposit will be refunded shortly after your holiday, providing the caravan is left in good order - Please see our booking and pricing terms. 1 large dog or 2 small dogs are welcome in our caravan, please bring your own bedding for them and we request that you keep them out of the bedrooms and off the furniture. We know that most dog owners are responsible and (unlike many caravans) we make no extra charge for dogs, but if they cause damage, or the caravan requires extra cleaning, we reserve the right to take the extra costs from your deposit. The caravan is available from 4pm on the day of your arrival and we would ask that you vacate the caravan by 11am on the day of your departure. We keep the availability calendar up to date, so you can check the price and see if the week you require is available. If you wish to book or require more information, please phone or email. Additional Info: (Some facilities may require membership)Pub/Club, Amusement Arcade, Tennis Court, Indoor Heated Pool with lifeguards, Laundrette, Crazy Golf, Grocery Shop, Takeaway, cash machine, Restaurant, Kids Club for all ages, 2 park mascots Sid the seagull and Lizzie lizard for kids entertainment, fabulous nightly entertainment, on site bar and grill, with pool tables and darts, ten pin bowling, adventure playground, indoor soft play area, Multi sports court with football, basketball, tennis and hockey, crazy golf, quiet zone garden area, wildlife nature trail, dog walking zone, 24 hour security, 12 hour reception. WE HAD A LOVELY WEEK AT FAYE AND ADRIAN'S CARAVAN,WELL EQUIPED AND VERY COMFORTABLE. VERY DOG FRIENDLY AS WELL, WOODY ENJOYED HIS CHEW WHICH WAS LEFT ON THE TRAY WITH COMPLIMENTARY TEA AND COFFEE FOR US, IT WAS A LOVELY TOUCH THANKYOU. WE DID GO INTO THE CLUB HOUSE ONE DAY WHERE THERE IS A SPECIAL SITTING AREA IF YOU HAVE A DOG. PLENTY TO DO ON SITE IF YOU HAVE CHILDREN WITH YOU. VERY HANDY TO HAVE A SHOP AS WELL.WE WOULD LOVE TO VISIT AGAIN ONE DAY SOON. THANKYOU FAYE AND ADRIAN. We have just had a wonderful week away, ideal location which is just outside Looe but less than a mile to the nearest beach and some wonderful coastal walks, we didn't spend much time on the site but there seemed like there was plenty to do, the caravan was perfect and communication with Faye was superb, 100% recommended. The caravan was perfect. Very well equipped with everything you need for a fab holiday. The owners are lovely, although we didn't actually meet them but responded quickly to messages (nothing negative). The site itself is quiet, ideal for relaxing. The only down side is that its not coastal but a short drive will take you to Looe and Polperro, both lovely fishing villages. Altogether a perfect getaway. Would highly recommend. Return guests to this caravan and park, again another fab holiday, same fantastic customer service from Faye and Adrian and the Park staff too. Will see you next year! Accommodation was spacious and very clean with all household essentials. All local amenities on site and a lovely takeaway serving fish & chips just outside of complex. 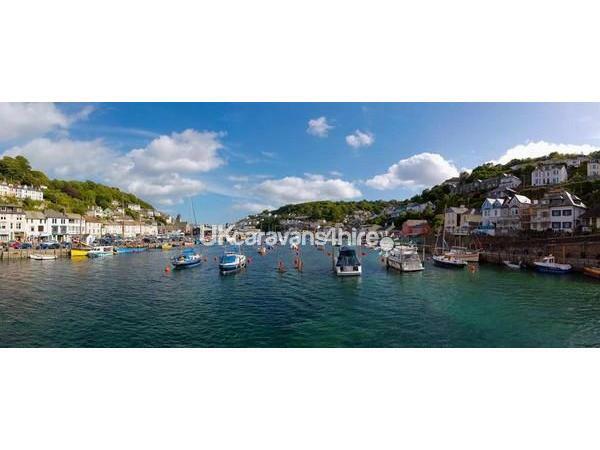 The location is good as Looe town centre is a 5min drive away. We had a great stay in this superb location. The caravan is excellent value for money and was spotlessly clean. Thanks for a great weekend. Great location. Smooth booking process. Fabulous caravan. Everything you could need is there for you to use. The location is brilliant, lovely and quiet and a sea view. If you have any queries Faye is only at the end of the phone to help you out. Will definatley be reccommending this caravan to friends. Beautiful place in a beautiful setting. Never really stayed in a static before but this was the perfect place to stay for us right in the middle of everywhere we needed to be. The place was perfectly tidy and the complementary tea coffee and WiFi was a lovely touch. Adrian even went in before we got there to put the heater on for us so was lovely and warm when we arrived. They are perfect hosts and if ever in the area again would love to stay here again. Thank you again.